This swiftwater rescue advanced class is the second class needed for personnel wanting to meet the requirements of the National Fire Protection Association (NFPA) 1670 Standard and the NFPA 1006 Standard at the Technician Level for water. 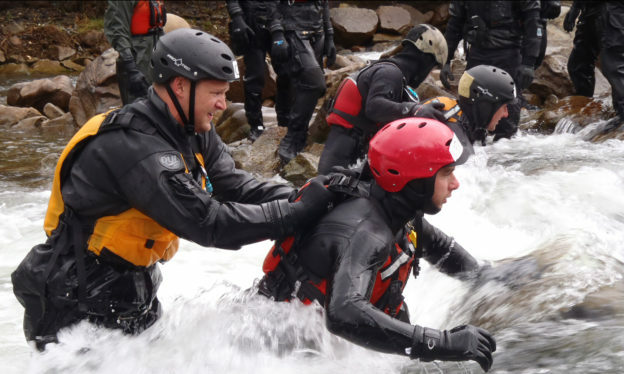 This course takes the student who has completed Swiftwater Rescue Technician 1 (SRT-1) beyond the emphasis of self-rescue and further concentrates on rescue in hard to get to areas and more difficult swiftwater situations. This is done by integrating the SRT-1 techniques into more difficult technical swiftwater rescue situations. The Swiftwater Rescue Technician Advanced curriculum is specifically designed for fire fighters, rescue teams and professional rescuers who need the best swiftwater training available! The course also includes a night search and rescue operation in a river environment, It is a very active and fun course for students who are up for the challenge. and basic flood disaster management.